News > TECNOFOAM G-2060 Foam designed for insulation of transitable inverted roofs. We have extended our range of polyurethane foams with the inclusion of the new TECNOFOAM G-2060, a foam specifically formulated for the application and formation of high density polyurethane foam (±52~62 kg/m³). This new foam replaces the previous TECNOFOAM G-2050 which has now been withdrawn from our catalogue. All the tests conducted with the new TECNOFOAM G-2060 have produced even better results than its predecessor, making it ideal for inverted roof systems in combination with TECNOCOAT P-2049 polyurea. TECNOFOAM G-2060 is a completely closed cell foam, a composition which directly influences its fundamental properties, such as thermal conductivity, absorption and waterproofing, permeability to water vapour, dimensional stability and resistance to compression. Roofs which use a system with a high density and resistance to compression are normally considered transitable. In the TECNOFOAM G-2060 + TECNOCOAT P-2049 system, the high compression resistance of the polyurethane foam, the formation of a regular surface thanks to “closed cell” nature, together with the high resistance of the polyurea, allow the creation of a system which is ideal even for vehicle traffic purposes. It is also a system widely used in all types of roofs (inclined or otherwise) with insulation and waterproofing requirements: roofs for farms, industrial warehouses, shopping centers, etc. 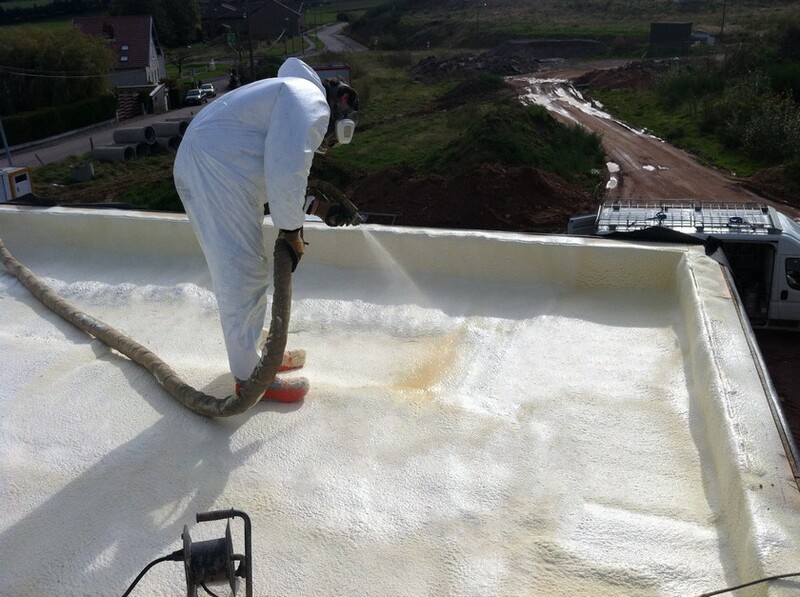 TECNOFOAM G-2060 allows the application of a polyurea membrane over its exterior coat in a continuous form without the risk of “pinholes” or bubbles forming. TECNOFOAM G-2060 is a product with high insulating capacity, easy to apply covering all surfaces. The application and formation of the foam are carried out means a spray equipment. It is specially designed to be coated with TECNOCOAT P-2049, without the appearance of bubbles, “pinholes” or other pathologies. It does not emit any substance to the environment once installed. The properties of this polyurethane foam system allow it to adhere to any surface such as concrete, ceramic, metal, polyurethane foam, wood, acrylic paints (checking the situation of areas recommended). It has CE mark on the basis of a declaration of performance DoP prepared in accordance with EU regulation 305/2011. www.tecnopol.es or statement available on demand.